Other Products by Body Science. Search other Protein Bars products. 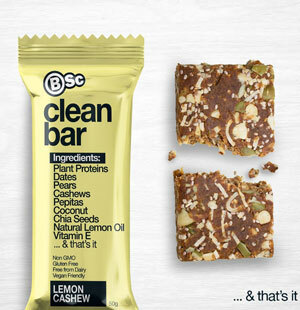 Body Science BSc Clean Bar is the protein bar that you've always wanted but never known it. Body Science have gone all-out on this one, delivering to the marketplace (and the lucky consumer) a quality product that not only offers wholefoods and convenience—all in one concise wrapper—but also taste, value for money and premium quality vegan-friendly plant proteins. And it's also 100% Non-GMO. You really couldn't ask for anything else. The majority of protein bars out in the marketplace do not deliver a product that is vegan or healthy. In fact, healthy is probably one of the most mis-understood terms in human language. This is primarily because so many of us are still trying to stick to the one-size-fits-all approach. By this rationale what is good for you is good for everyone on the face of the earth, and in space. Well, unfortunately this rule just does not seem to work too well, as we are all slighty different genetically, and therefore have varying nutritional needs. One point that does not waver, however, is that the sorbitols, mannitols and all of the other fillers that are used in protein bars are simply not good for us, and can negatively impact our digestive health. That's why Body Science have gone 100% plant-based, all-natural and Non-GMO. These bars actually support your wellness goals, not hinder them. 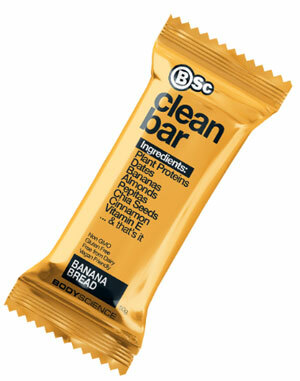 Body Science BSc Clean Bar contains three protein powders, derived from soy, rice and pea. It also contains a small amount of naturally occurring protein found in the pepitas, almonds and chia seeds, which also deliver quality fats of the good kind. It is interesting to note that soy protein actually has a high biological value, comparable to hydrolysed whey protein, both of which are a great deal more bioavailable that casein1. This is due to the fact that soy protein has a ratio of the essential amino acids that the tissues of the body can uptake with ease. Soy protein is a well known stimulator of muscle protein synthesis, which is integral in adaptation to exercise. 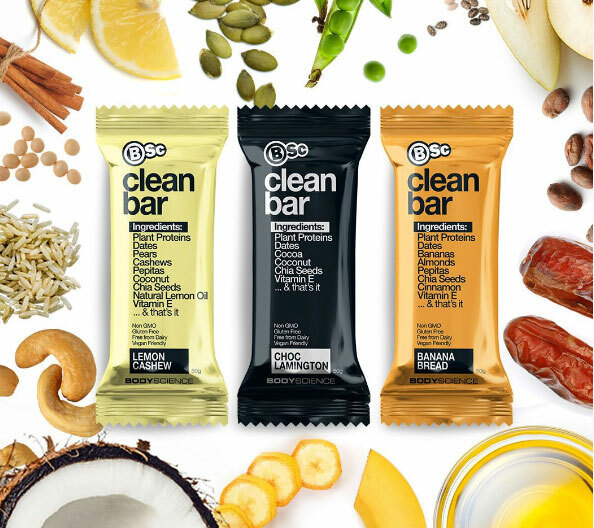 Body Science BSc Clean Bar are absolutely delicious and perfect for so much more than just a treat. These flavoursome delicacies are fine for daily use, and to support recovery after exercise or sports. INGREDIENTS: Dates, Bananas, Almonds, Soy Protein Isolate, Rice Protein Isolate, Pepitas, Chia Seeds, Pea Protein Isolate, Cinnamon, Antioxidant (Vitamin E).